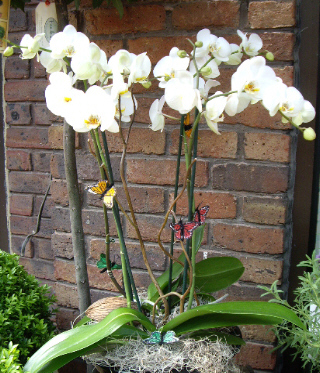 This is a simply elegant double stem Orchid in a black ceramic Pot with moss and decorated with butterflies. Their name (pronounced fal-ee-nop-sis) is from the Greek and means moth-like. This long stemmed plant has become indicative of grace and elegance and the flowers represent love, beauty and magnificence. Orchids have been wrongfully labelled as hard to care for but they are actually very low maintenance. 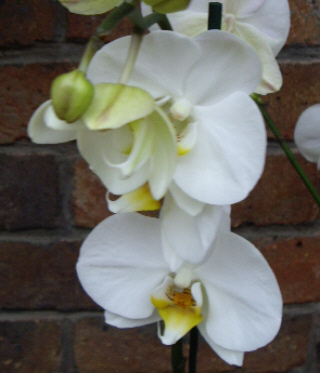 Phalaenopsis make excellent house plants and will thrive in a centrally heated house providing some basic care is given. Simple misting with clean water several times a week during the summer or standing the plant pot on a large plate of wet pebbles will provide adequate humidity. You can order online or by telephone call 01628 675566 Monday -Saturday 9am - 5pm. From outside UK dial +44 1628 675566. Please note that seasonal availability of individual stems may vary from those in the picture. Our professional florist may substitute flowers for a suitable alternative, similar in style, quality and value. Where flower designs include a sundry item such as a vase or basket it may not always be possible for our florists to include the exact item pictured. Every effort will be taken to ensure that the item is substituted for a similar design. 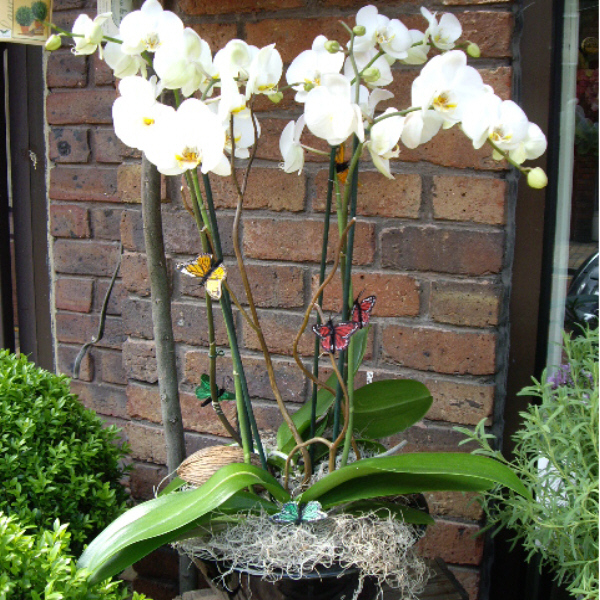 Large Double Stem White Phaleanopsis Orchid in Ceramic Pot is your Bespoke Orchid design... by Fleur de Lis .